The Challenge: Many entrepreneurs unintentionally follow the herd and replicate how it's been done before. Most entrepreneurs tell us that they are not earning what they believe they and their businesses are worth, and they are working more hours. Many times we do not achieve the results we know are possible because we don't know the best questions to ask ourselves. As a result, we continue doing the same things in a version of More, Better, Faster. We work harder, try to increase what we earn for the time we invest, and in general run harder to make more or just stay where we are. Success Magnified, using the Pinnacle Success System teaches entrepreneurs how to substantially increase earnings while substantially decreasing the time – and to enjoy the journey significantly more. We do this by asking entrepreneurs counter-intuitive questions leading to AND rather than the often false beliefs of OR. We show entrepreneurs how to earn more AND to have more freedom. More success AND more enjoyment. More time AND more money. Our success system provides a proven, sustainable, and upwardly iterative model that entrepreneurs can reliably use to accomplish their goals related to more earnings and more time and enjoying the experience. This is the foundational component for the rest of the success system. Peter Drucker, the management guru who is often called the father of management said, “Most people think they know what they’re good at—they’re usually wrong.” Our observations support this and when we ask entrepreneurs what their Pinnacle Gift™ is they often have difficultly identifying it. Entrepreneurs achieve significantly higher levels of success when they are crystal clear about why they are on the planet and they ensure that their Pinnacle Gift™ is the basis on which their entire business is built. The ramifications of viewing every other aspect of the Success System and a business through this filter are extraordinary. The foundational component for this Pillar, is the filter through which we focus on productivity. Unlike traditional systems that assume time is scarce and the solution is to fit more into less time, Success Magnified believes that time is abundant and teaches entrepreneurs how to create this abundance in their businesses and lives. This Pillar focuses productivity based first on each person's Pinnacle Gift™, and then on four distinct categories of productivity. The result is a proven method to dramatically accomplish and earn more in significantly less time – and to enjoy the journey. 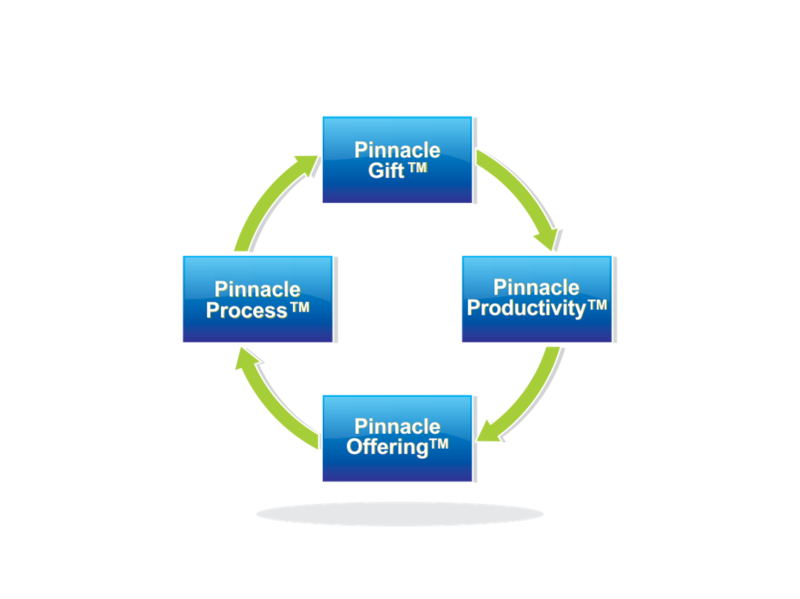 Pinnacle Offering™: After becoming clear about Pinnacle Gift™ and how to transform productivity, the next step is to migrate the business up the Competition Continuum. We find that before understanding their Pinnacle Gift™ and how to incorporate their gifts into their businesses, most entrepreneurs undervalue their offering and are unintentionally commoditizing themselves and their businesses. Pinnacle Offering™ teaches entrepreneurs to move up the competition continuum both in their offering and with the customers they choose to work with. The result is a more unique business and offering resulting in higher margins and profitability, and more confidence about pricing, customer acquisition, and being in control of the business’s future. The final step is to develop a unique, powerful, and specialized process based on the new awareness gained in the prior Pillars. For many entrepreneurs part of the Pinnacle Process™ is visual (The Pinnacle Success System™ is an example of a visual process). The outcome of this step is that entrepreneurs have created a very niched business that focuses on their most profitable customer and customer’s needs, and can now clearly represent how they can uniquely solve their customers’ needs in a manner that only they can offer. The Pinnacle Success System™ provides entrepreneurs with a process to move up the Competition Continuum by de-commoditizing their view of themselves and their businesses and then applying this new awareness to all aspects of their productivity, offering, and processes. The results are extraordinary. The cost for each course is $249. To sign up for a course please click on one of the "Buy Now" links below. Please Note: After clicking "Subscribe" if you prefer to pay by credit card rather than through a PayPal account, choose the second option at the bottom of the page that looks like this: No PayPal account? Pay using your credit or debit card. Know the Value You Bring & Be Able to Communicate It.